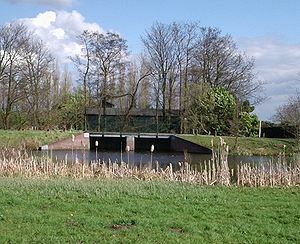 The Dutch Water Line (Dutch: Hollandsche Waterlinie, modern spelling: Hollandse Waterlinie) was a series of water-based defences conceived by Maurice of Nassau in the early 17th century, and realised by his half brother Frederick Henry. Combined with natural bodies of water, the Water Line could be used to transform Holland almost into an island. In the 19th century, the Line was extended to include Utrecht. Early in the Eighty Years' War of Independence against Spain, the Dutch realized that flooding low-lying areas formed an excellent defence against enemy troops. This was demonstrated, for example, during the Siege of Leiden in 1574. In the latter half of the war, when the province of Holland had been freed of Spanish troops, Maurice of Nassau planned to defend it with a line of flooded land protected by fortresses that ran from the Zuiderzee (present IJsselmeer) down to the river Waal. In 1629, Prince Frederick Henry started the execution of the plan. Sluices were constructed in dikes and forts and fortified towns were created at strategic points along the line with guns covering especially the dikes that traversed the water line. The water level in the flooded areas was carefully maintained at a level deep enough to make an advance on foot precarious and shallow enough to rule out effective use of boats (other than the flat bottomed gun barges used by the Dutch defenders). Under the water level additional obstacles like ditches and trous de loup (and much later, barbed wire and land mines) were hidden. The trees lining the dikes that formed the only roads through the line could be turned into abatis in time of war. In wintertime the water level could be manipulated to weaken ice covering, while the ice itself could be used when broken up to form further obstacles that would expose advancing troops to fire from the defenders for longer. The Dutch Water Line proved its value less than forty years after its construction during the Franco-Dutch War (or Third Anglo-Dutch War) (1672), when it stopped the armies of Louis XIV from conquering Holland, although the freezing over of the line came close to rendering it useless. In 1794 and 1795, the revolutionary French armies overcame the obstacle posed by the Dutch Water Line only by the heavy frost that had frozen the flooded areas solid. After the final defeat of Napoleon in 1815 at the Battle of Waterloo, the United Kingdom of the Netherlands was formed. Soon after King William I decided to modernise the Water Line. The Water Line was partly shifted east of Utrecht. In the next 100 years the main Dutch defence line would be the new Water Line. It was further extended and modernised in the 19th century, with forts containing round gun towers reminiscent of Martello towers. The line was mobilised but never attacked during the Franco-Prussian war in 1870 and World War I. At the advent of World War II, most of the earth and brick fortifications in the Water Line were too vulnerable to modern artillery and bombs to withstand a protracted siege. To remedy this a large number of pillboxes were added. However, the Dutch had decided to use a more eastern main defence line, the Grebbe line, and reserved a secondary role for the Water Line. When the Grebbe Line was broken on May 13, the field army was withdrawn to the Water Line. However, modern tactics could circumvent fixed defense lines (cf. the French Maginot line). While the Dutch army was fighting a fixed battle at the Grebbe Line, German airborne troops captured the southern approaches into the heart of "Fortress Holland" by surprise — the key points being the bridges at Moerdijk, Dordrecht and Rotterdam. When resistance did not cease, the Germans forced the Dutch into surrender by aerial bombing of Rotterdam, and threatening the same for Utrecht and Amsterdam. From its conception in 1815, until the last modernisation in 1940, around 50 billion Euro was spent on the New Dutch Water Line. After World War II, the Dutch government redesigned the idea of a waterline to counter a possible Soviet invasion. This third version of the Water Line was erected more to the east at the IJssel (the IJssel Line) and in Gelderland. In case of an invasion, the water of the Rhine and the Waal were set to divert into the IJssel, flooding the river and bordering lands. The plan was never tested, and it was dismantled by the Dutch government in 1964. Today many of the forts are still more or less intact. There is renewed interest in the waterline for its natural beauty. Bike tours and hiking paths are organised with the line as a theme. Some of the forts are open for bikers/hikers to stay the night. Others have a variety of uses, for example Utrecht University houses its botanical garden in Fort Hoofddijk. Due to the unique nature of the line, the Dutch government is considering whether to nominate the whole defensive line as a UNESCO world heritage site, as they did with the ring of fortresses around Amsterdam. A 25-year plan has been developed by the artist, Agnes Denes. In 2010, one of the forts on the Line, Bunker 599, was opened as a publicly accessible work of art. The bunker was sliced open, with a walkway placed through it forming an installation allowing a view to look into and through the bunker. To protect weaknesses in the waterline a series of forts and fortified towns have been constructed. Order of forts following the line from north to south. Wikivoyage has a travel guide for Naarden. This page was last edited on 5 April 2019, at 06:37 (UTC).